One of the neat little sub-features of Amazon’s Kindle is being able to subscribe to blogs on it. You have to pay for the privilege, but for heavy Kindle users, it makes sense as you can get the content delivered to you wirelessly for your favorite blogs. You know, like TechCrunch. But the biggest limiting factor of this so far is that only the big blogs have been included in the blog directory. 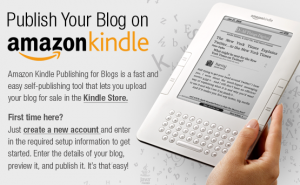 Starting today, anyone can make their blogs available via the new Kindle Publishing for Blogs Beta program. All you have to do is make your blog’s feed available to the Kindle Store, and Amazon will do the rest, formatting your content for the device. According to the email from Amazon, after a few easy steps, your blog should be up and ready to go in the Kindle Store after about 12 to 48 hours of processing. Not bad. As with blogs currently in the program, these new blogs will get 30% of the monthly blog subscription price for every subscriber Amazon signs up. In a world where mobile app developers traditionally keep 70% or more of the revenues, 30% seems awfully low. And exactly how much Amazon will charge for each blog isn’t totally clear, other than Amazon says it will “define the price based on what we deem is a fair value for customers.” Most blogs currently go for $1.99 a month. Unfortunately, even if you want to, you can’t give your blog away for free on the device. Amazon has that WhisperNet to maintain, after all. As a Kindle owner, I currently subscribe to a few of my favorite blogs, but for most of the rest I use Instapaper to bookmark articles and sync them over email to my device (which does cost a ridiculous $0.15 an email unfortunately — but Instapaper sends only one digest a day). The bottom line is that with 30% of the subscription price going to publishers, this isn’t likely to be a big source of income for most sites. There are simply too many blogs and the Kindle market is simply not that big. And the people who will pay for blogs on it is even less.